Classic Italian dish full of warm and comforting flavors. 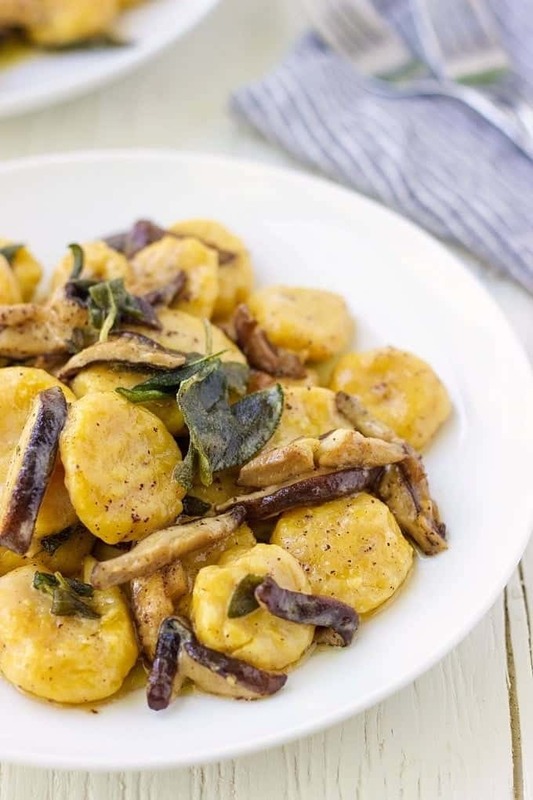 These Pumpkin Ricotta Gnocchi will delight your family and friends. It started with “what can I do with pumpkin this season”? Despite my love for this fall vegetable, I rarely make anything with it. I don’t know why, don’t ask me. It’s just the way it is. But fall is the period when everyone jumps into pumpkin recipes craze and starts to create yummy treats. Well, I don’t want to feel left out from this party, so I figured the best way to celebrate fall is by making gnocchi. I have tell you honestly, the first time I made gnocchi, it was a total carb overload. It was exactly one year ago and although I followed the recipe for potato gnocchi precisely, mine ended up with too much flour, thus they were a little on the heavier side. But as you know, practice makes perfect. So after reviewing my mistakes, I decided that this simple Italian recipe needs to be conquered. And what is the best ingredient to make gnocchi this fall? Of course, it is pumpkin. This time, I went further I omitted potatoes. Instead, I used ricotta cheese, which made my gnocchi soft and delicate. Pumpkin provided warm and comforting flavors. And the sauce… Let me just tell you about the sauce. Shiitake mushrooms with their woodsy flavor, infused with sage brown butter and sautéed in creme fraîche. Does it make you drool? For me, the combination of words mushrooms and cream always makes my stomach growl. The sauce comes out super flavorful, you can’t help but lick the plate. 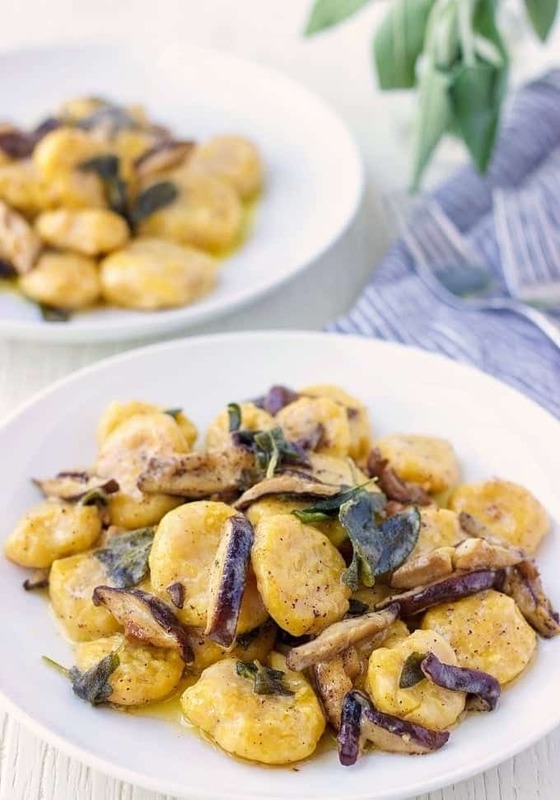 My husband told me these Pumpkin Ricotta Gnocchi were a restaurant type meal. Despite him being sceptical to all kinds of sauces, he absolutely loved this dish and I couldn’t be happier about that. In a large bowl stir together ricotta, pumpkin, egg yolks and 1 teaspoon of salt. Add 1 cup of flour and mix well. Add another cup of flour and see if the soft dough starts to form. Add another ½ cup if needed. The dough should be slightly sticky. Try not to hold the dough for too long, that way it won't be sticking to your hands. Lightly flour the working surface and divide the dough into 4 equal parts. Roll each part into a dowel shape about ⅝ inch in diameter and cut into ⅝ inch pieces. If you want, you can roll each piece into a ball and lightly press a fork against it. 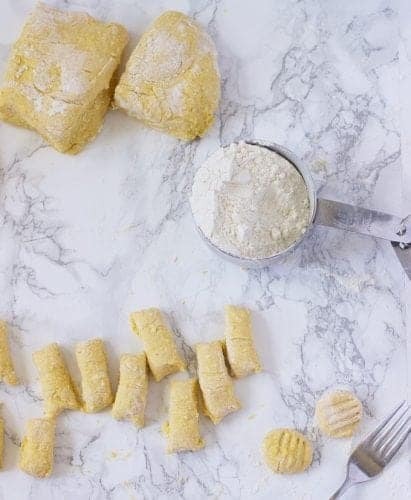 Transfer gnocchi onto a floured cutting board and place in a fridge while you make a sauce. Melt 10 tablespoon of butter in a small sauce pan and on the medium-low heat. Cook until it turns golden brown with a distinctive caramel flavor, about 7 minutes. Don't burn it. Add sage leaves and allow them to infuse butter, about 2 minutes. Off the heat and set aside. In a large sauté pan, melt 1 tablespoon, add minced garlic and cook for 30 seconds. Add shiitake, ½ teaspoon of salt and sauté until mushrooms have softened, about 5 minutes. Stir in sage butter and Crème fraîche, reduce the heat to minimum and cook for another 1-2 minutes. Meanwhile, put a large pot of salted water to a boil. Slowly add gnocchi and cook for 2-3 minutes until the rise to the surface. Remove with the slotted spoon and transfer into mushroom sauce. When making gnocchi, don’t rush in to add all flour. Start with one cup and knead the dough. Add a little more flour and knead again. 2 cups should be enough but if necessary, you can add 1/2 cup more. Be careful and don’t overdo with flour. The dough should be slightly sticky. The trick is to work fast with it, that way it won’t stick to your hands. Did you make gnocchi before? What is your favorite sauce to serve them with? I think it’s really tasty. looks delightful!